In-store pickup is currently available for 4x6 glossy prints only. Back-of-print message is not available. Look for the 1-hour pick-up link on the review order page. Prices may be updated by retail partners without notice and the final price will be calculated at the retail location. 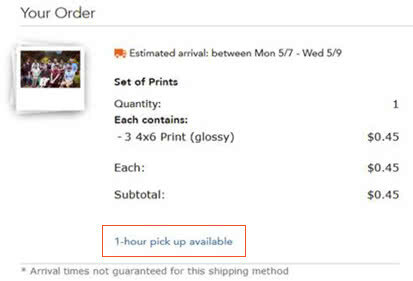 Shutterfly discounts, free print offers and prepaid print plans cannot be used with in-store pickup. The processing time may vary by store. Most stores offer 1-hour processing. Large orders with 100 or more prints may take up to 24 hours. Stores that do not have in-house printing capabilities may take between 3-7 days to process prints. You will be emailed when your order is ready for pick up. Items picked up at your local retailer will have to be paid for at the store. Local taxes may apply. Please bring a printed copy of the order confirmation email and proper identification when you pick up the order.